BHARATIYA Janata Party PresidentAmitShahonSaturday filed his nomination papers for the Gandhinagar Lok Sabha seat in Gujarat, promising to pursue the legacy of party veteran L.K. Advani who had represented the constituency since 1998 but was now denied a ticket. 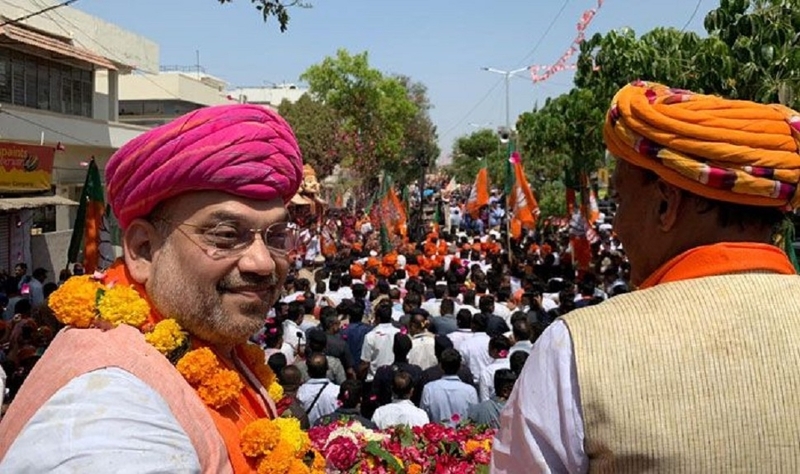 Shah, contesting his first Lok Sabha election,urgedthe people to vote for the Bharatiya Janata Party in all the 26 Lok Sabhaseats in the State to strengthen the handsofPrimeMinisterNarendra Modi, who he described as “Gujarat’s son”. Shiv Sena Chief Uddhav Thackeray, Shiromani Akali Dal supremo and former Punjab Chief Minister Parkash Singh Badal, LJP founder Ram Vilas Paswan as well as Union Ministers Rajnath Singh, Nitin Gadkari and Piyush Goyal were present on the occasion. The only notable absentee was Advani. Before filing his nomination, the BJP chief and party leaders addressed a gathering at Naranpura and held a huge road show. Addressing the gathering, Shah said whatever he had achieved in his life was because oftheBharatiyaJanataParty(BJP). Shah, a Rajya Sabha member, said he was lucky that he was the candidate in a seat which had been represented by stalwarts like P.V. Mavlankar, Atal Bihari Vajpayee and Advani. “Gandhinagar is the most developed parliamentary constituency ofthe country.I willtry my best to pursue the legacy of Advaniji.”TheBJPleadersaidthat the upcoming elections would be fought on the issue of leadership and the entire country was rooting for PM Modi. “This happened because of the leadership provided by Modiji. The country was looking for such a leader for the last 70 years. Who can provide security to the country?Only Modiji can do so”. Gujarat will go the polls on April 23. FACING criticism for indulging in a credit warforthe airstrikes in Balakot, Union Home Minister Rajnath Singh on Saturday said if former Prime Minister Indira Gandhi can be credited for creation of Bangladesh, Prime Minister Narendra Modi should also be congratulated for the action against terrorists. Addressing a public meeting here on the occasion offiling of nomination by Bharatiya Janata Party(BJP) President Amit Shah, Singh also hit out at Congress President Rahul Gandhi for calling him a “thief” and urged the people to “punish” him democratically. “Those who are saying that Balakot airstrikes are being politicised and PM is being credited, they have forgotten that Army divided Pakistan in 1971 war and created Bangladesh. Our leader Vajpayee jihad hailed Indira Gandhi in the Parliament. The entire country was doing so,” he said. After 40 of CRPF troopers were killed in Pulwama in Jammu and Kashmir, the Prime Minister showed strong determination to take the revenge. The Congress Government didn’t do anything after 26/11 Mumbai terror attack,” he said.